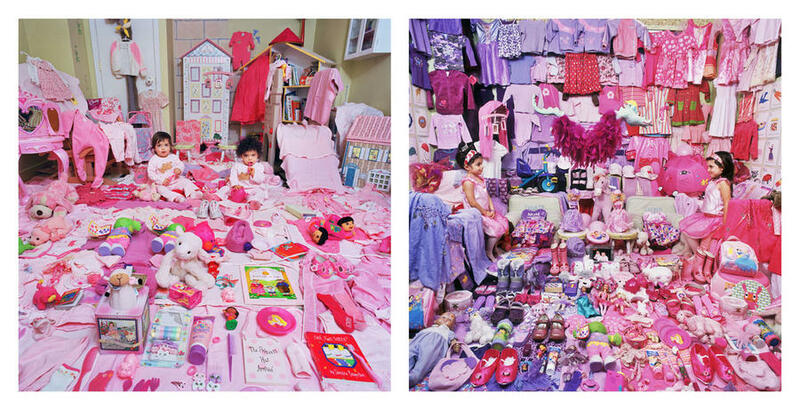 This project began with my daughter. 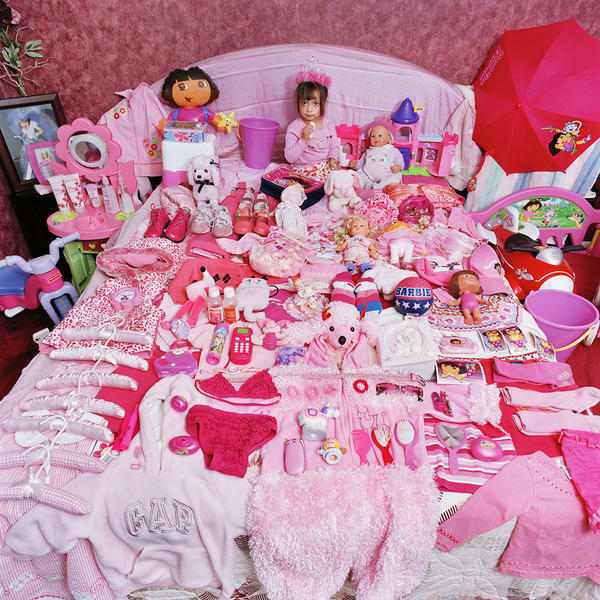 My six-year-old daughter loves pink. 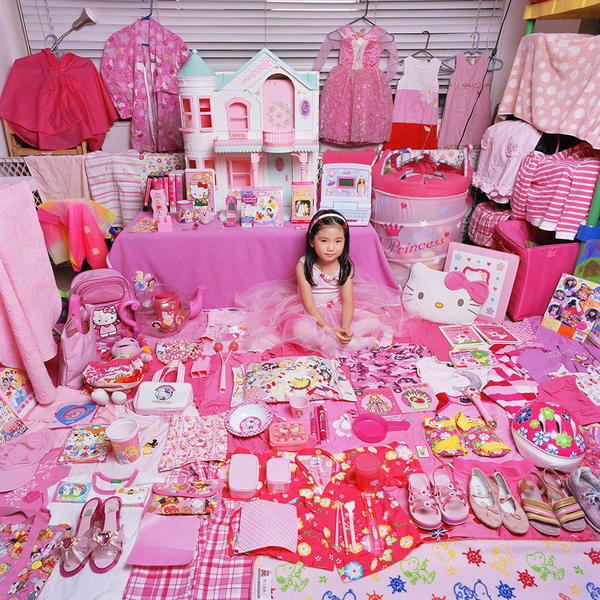 She wants to wear only pink clothes and only own pink toys and objects. 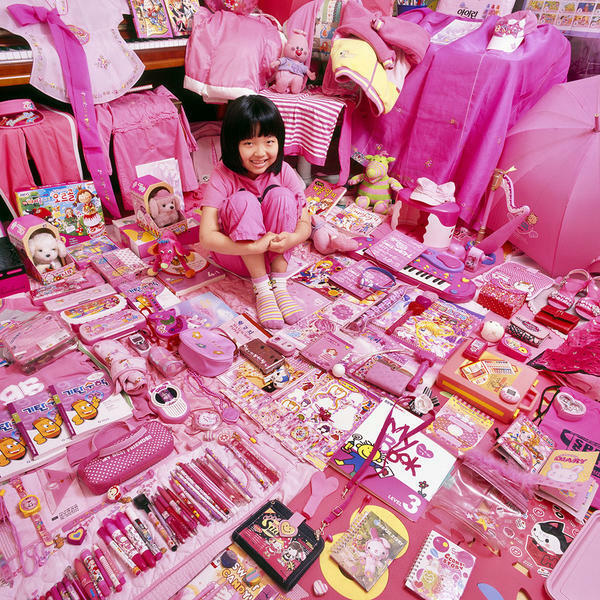 My daughter is not unusual. 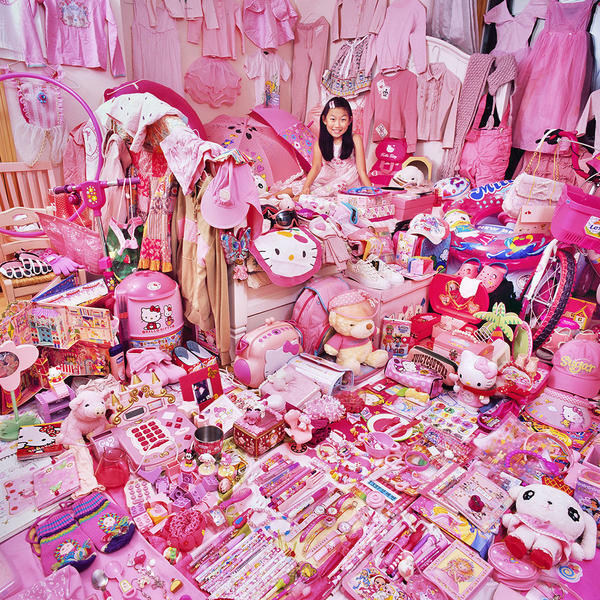 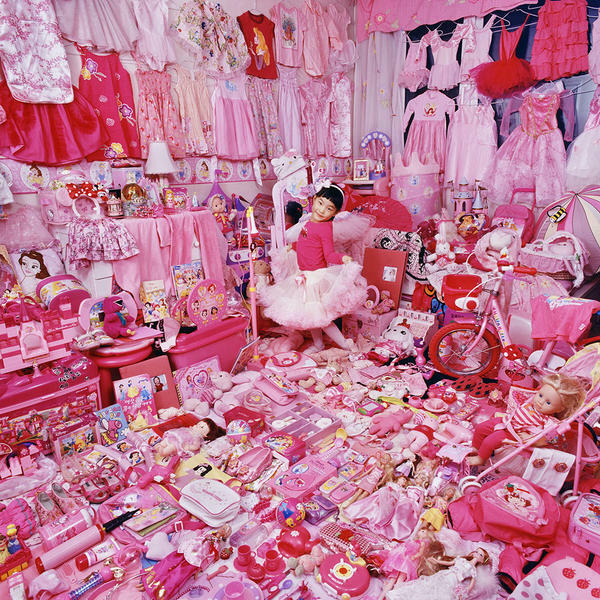 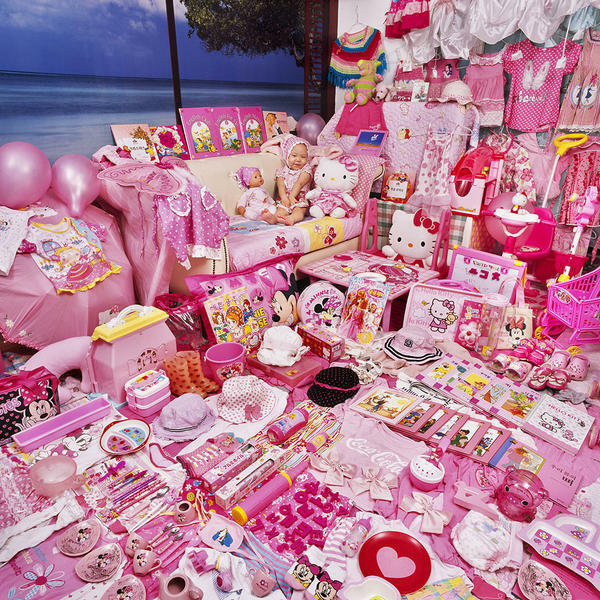 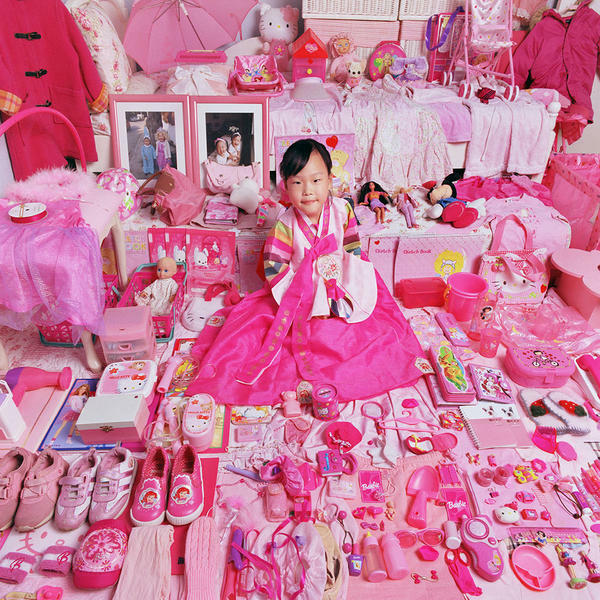 Most other little girls in the United States and South Korea love pink clothing, accessories and toys. 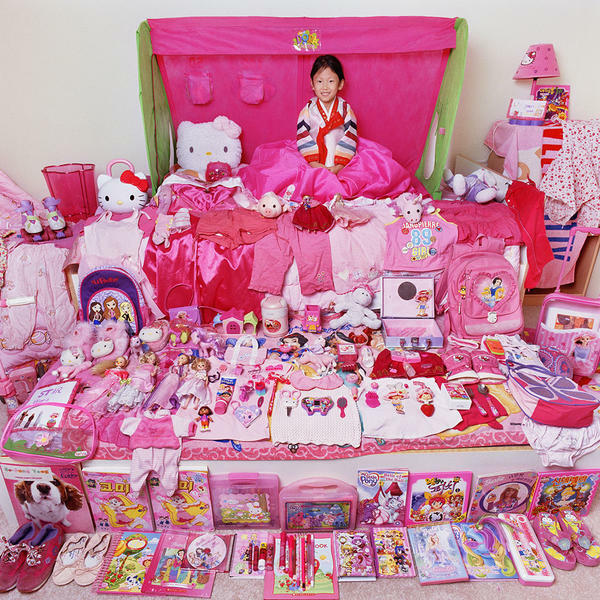 This phenomenon seems widespread among various ethnic groups of children regardless of their cultural backgrounds. 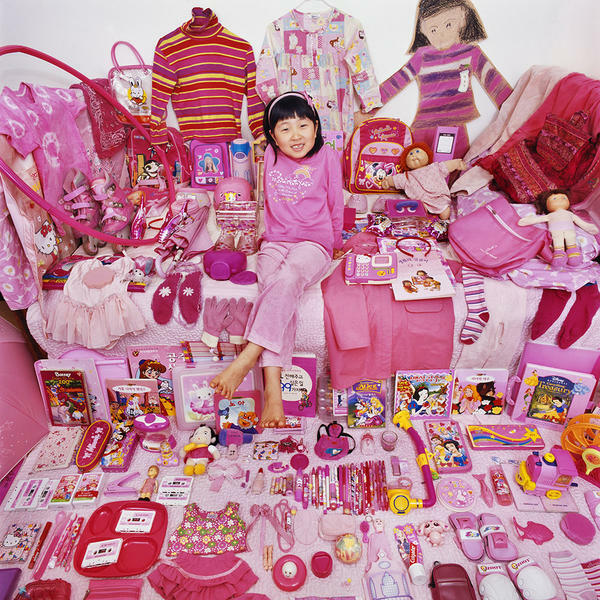 This preference is the result of cultural influences and the power of pervasive commercial advertisements such as those for Barbie and Hello Kitty. 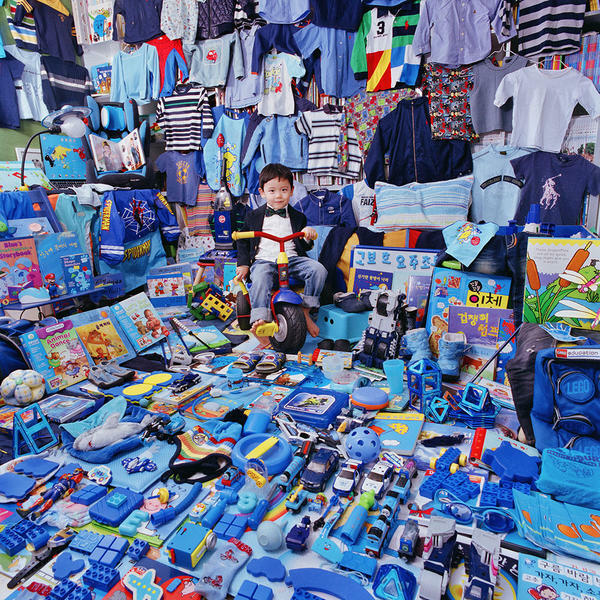 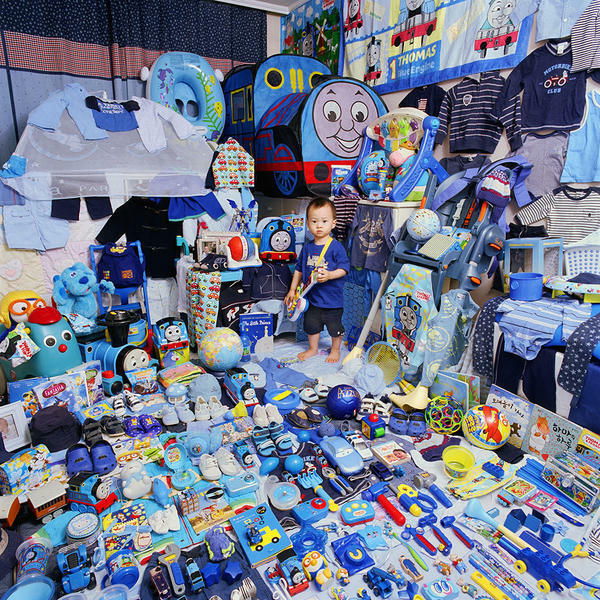 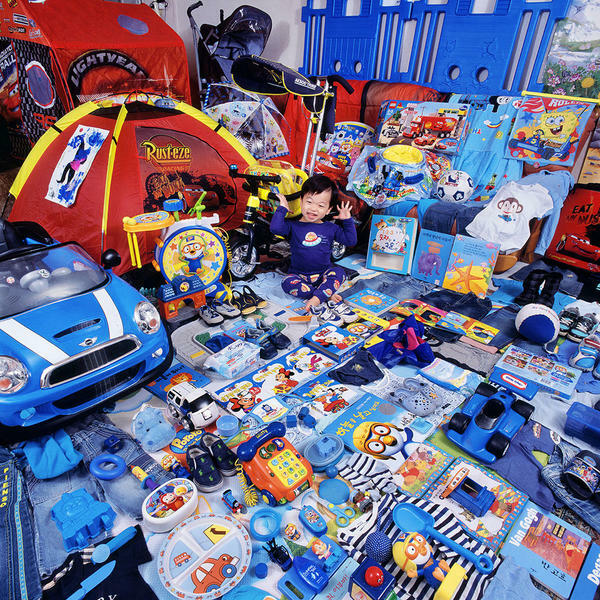 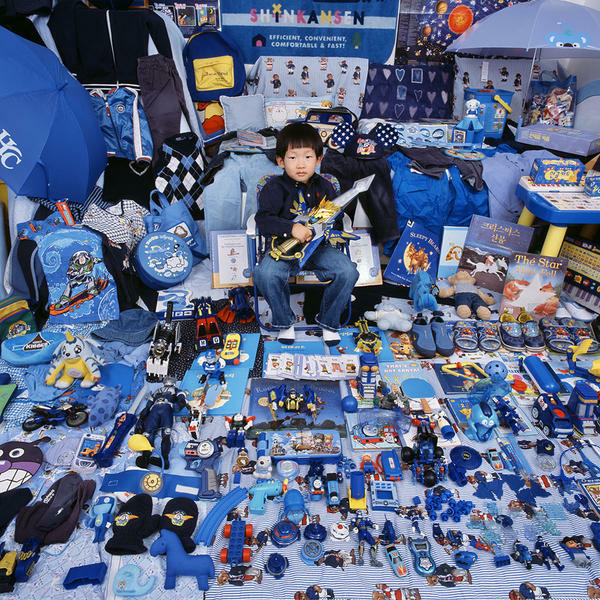 Through advertising, customers are directed to buy blue items for boys and pink for girls. 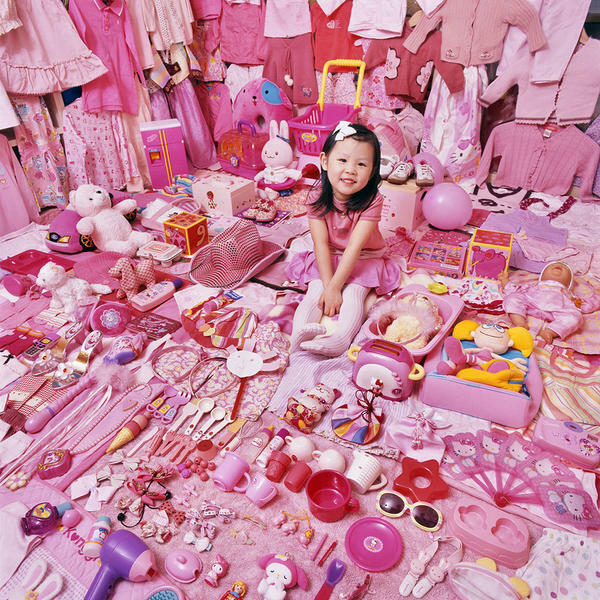 Blue has become a symbol of strength and masculinity, while pink symbolizes sweetness and femininity. 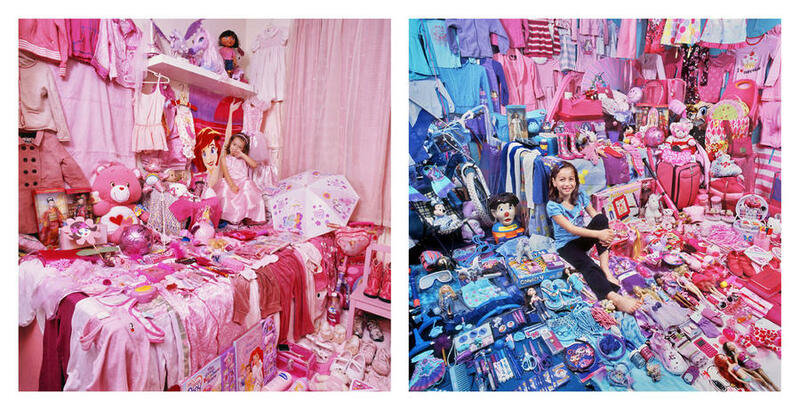 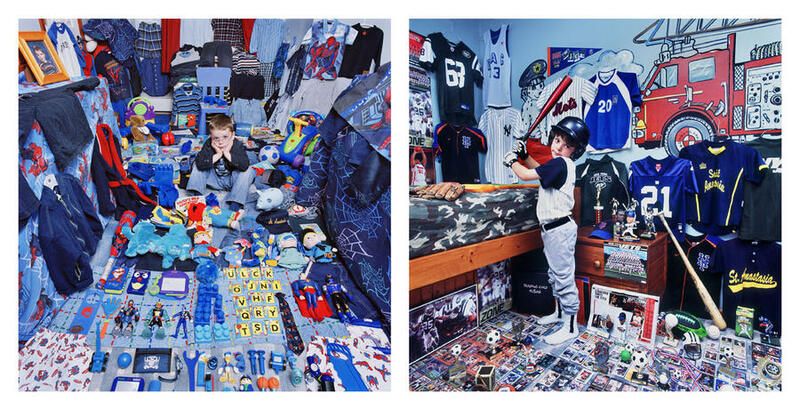 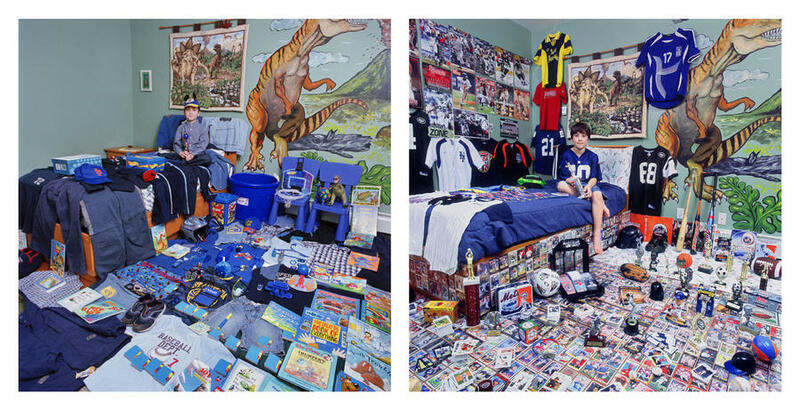 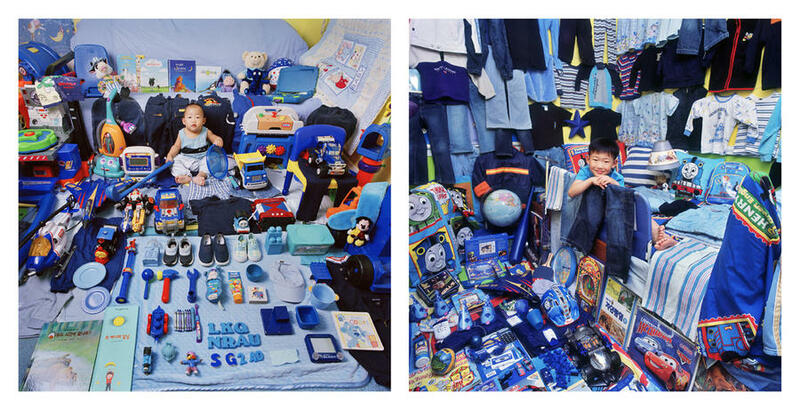 To make The Pink and Blue Project series, I visited children’s rooms, where I displayed their possessions in an effort to show the viewer the extent to which children and their parents, knowingly or unknowing, are influenced by advertising and popular culture. 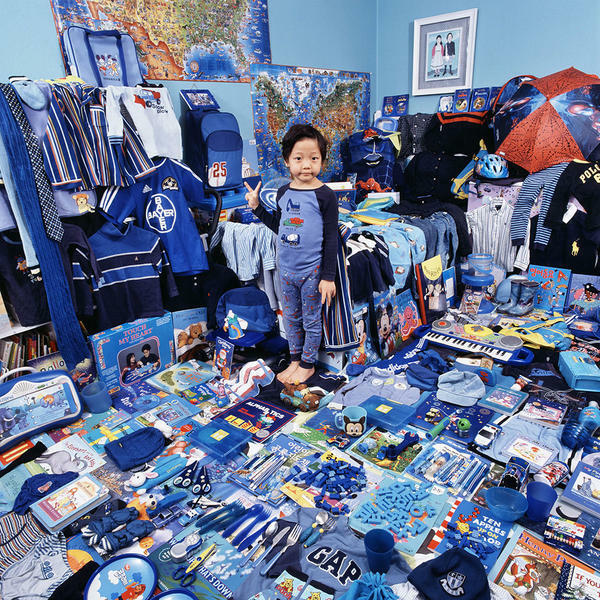 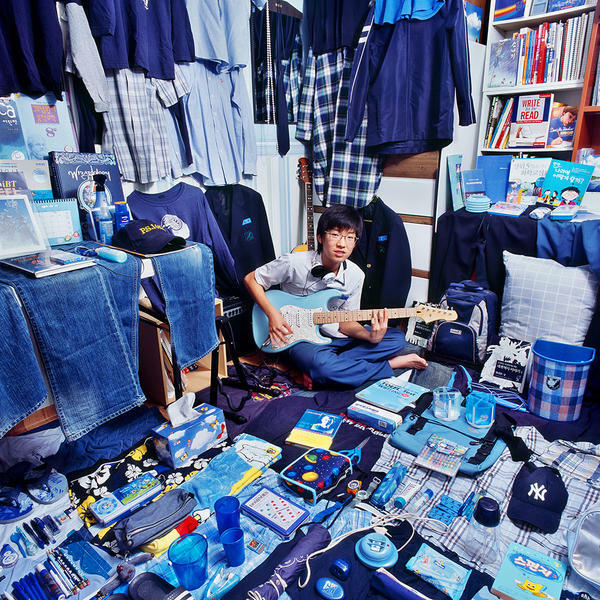 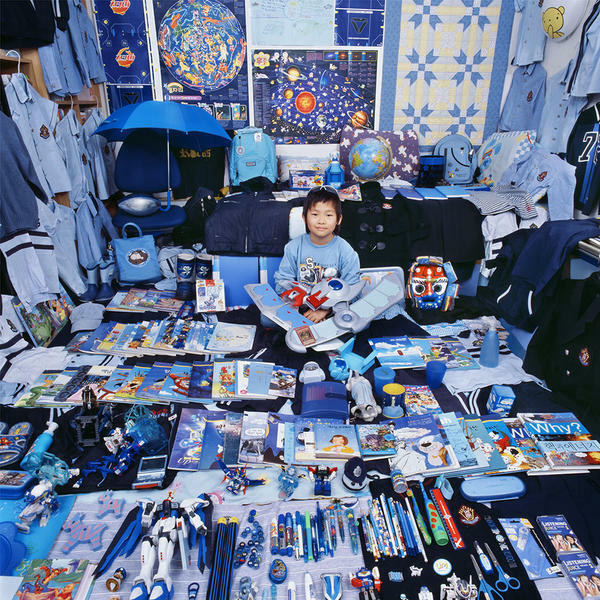 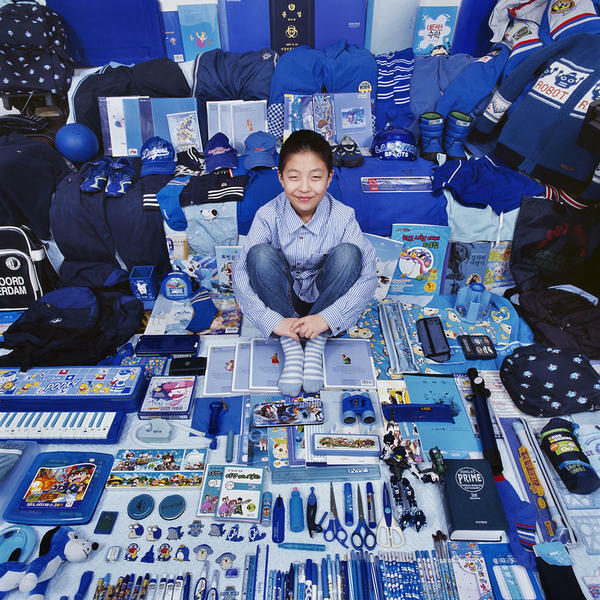 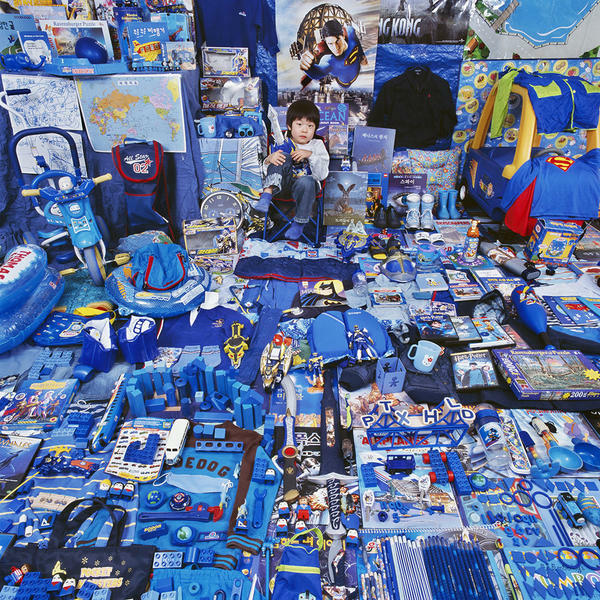 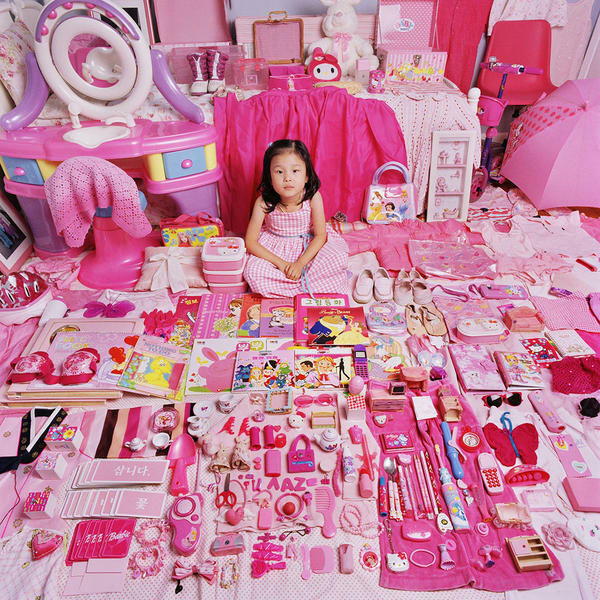 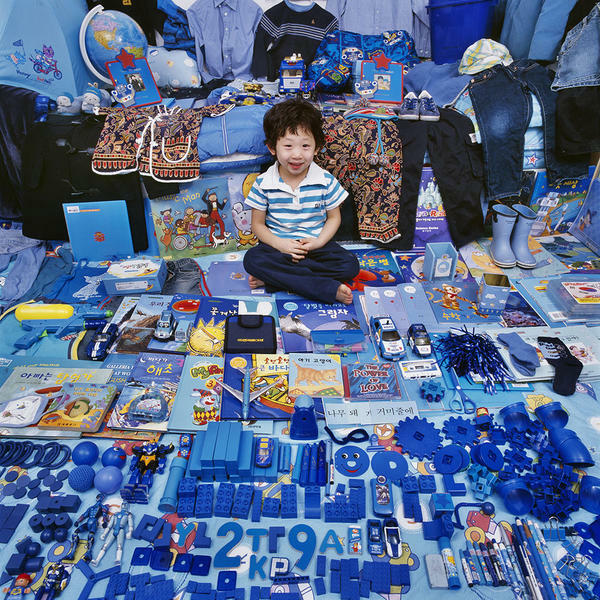 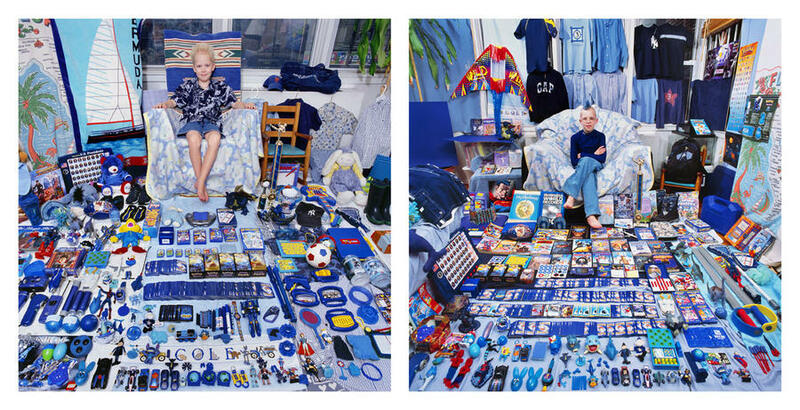 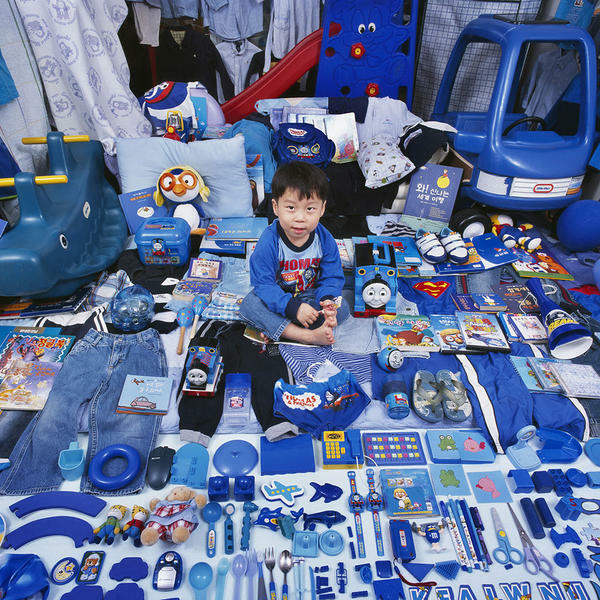 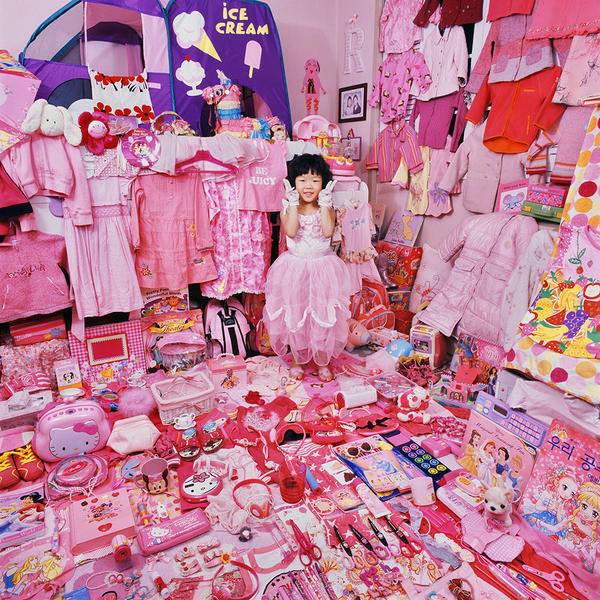 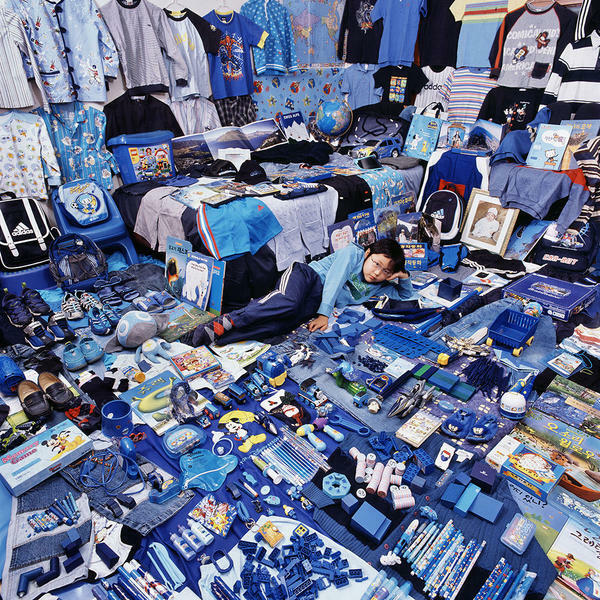 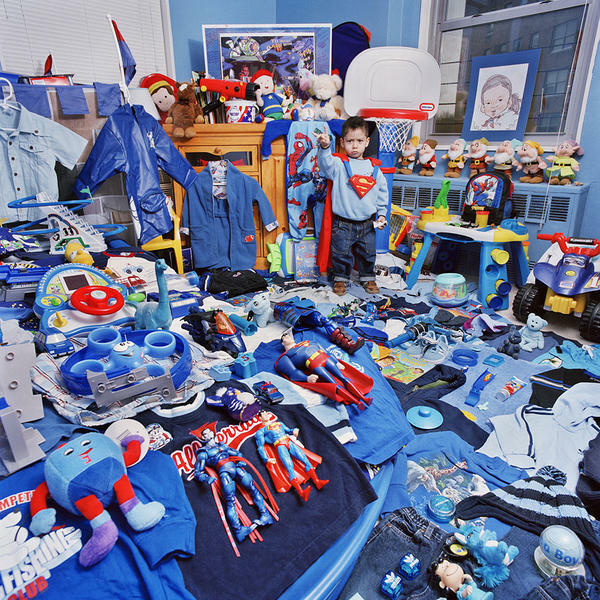 ‘The Pink & Blue Project I'(2005-ongoing) is photographs of boys and girls who love blue and pink colors respectably, and presents the children with their objects. 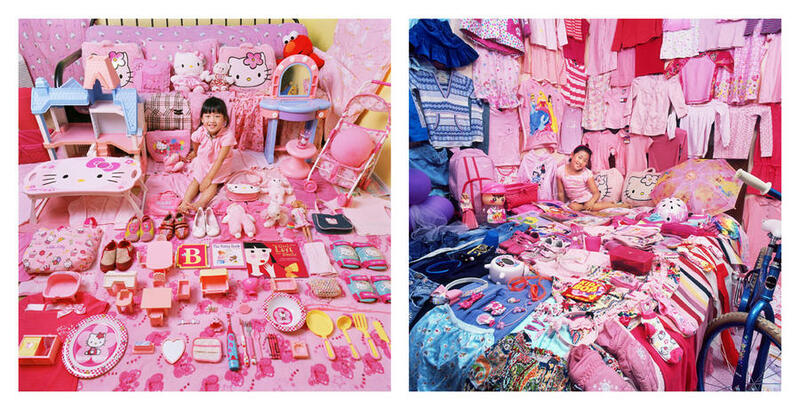 ‘The Pink & Blue Project II’ revisited those children after four years. 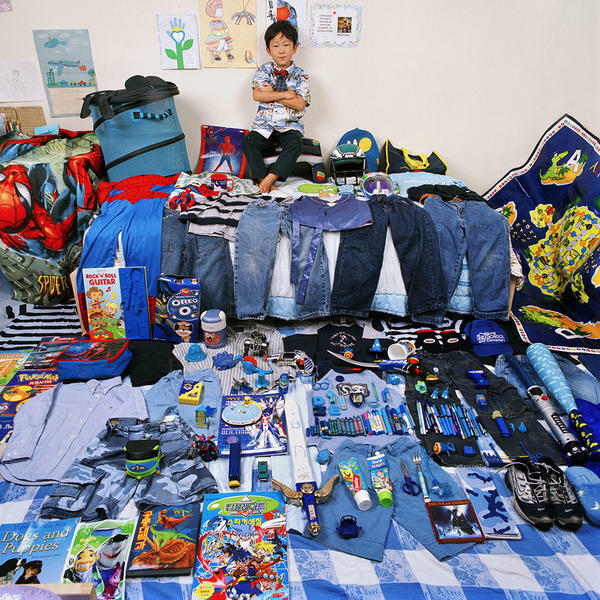 Since the last visit in 2005, the children have grown up and their interest in color has changed to various colors and tastes. 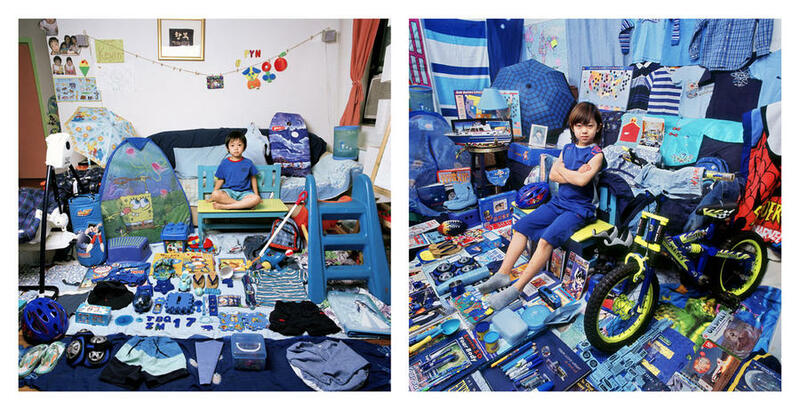 This project portrays the process of development of these children along with the socially assimilated part of today’s society. 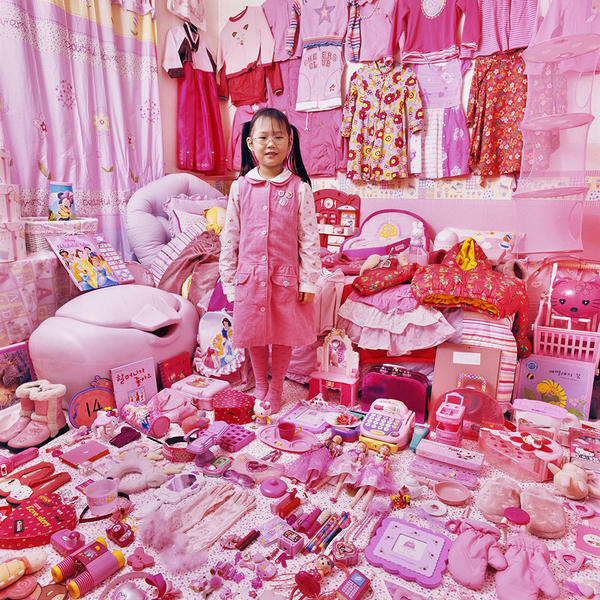 The Pink and Blue Project explores the trends in cultural preferences and the differences in the tastes of children (and their parents) from diverse cultures, ethnic groups as well as gender socialization and identity. 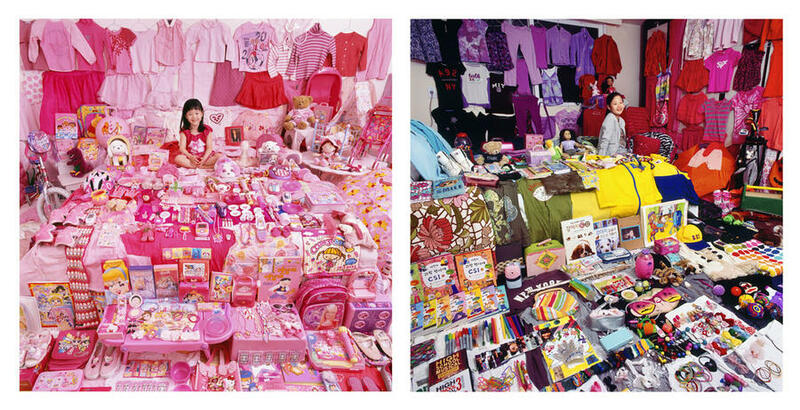 The work also raises other issues, such as the relationship between gender and consumerism, urbanization, the globalization of consumerism and the new capitalism. 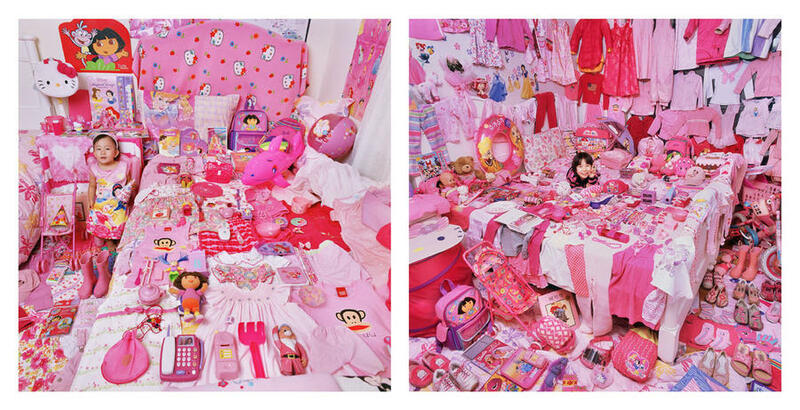 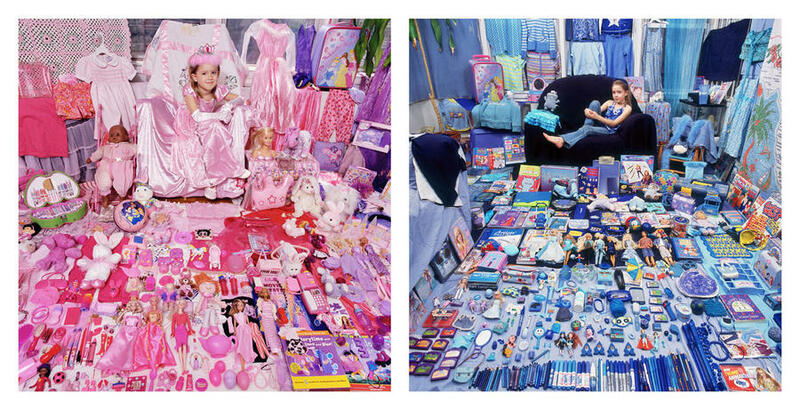 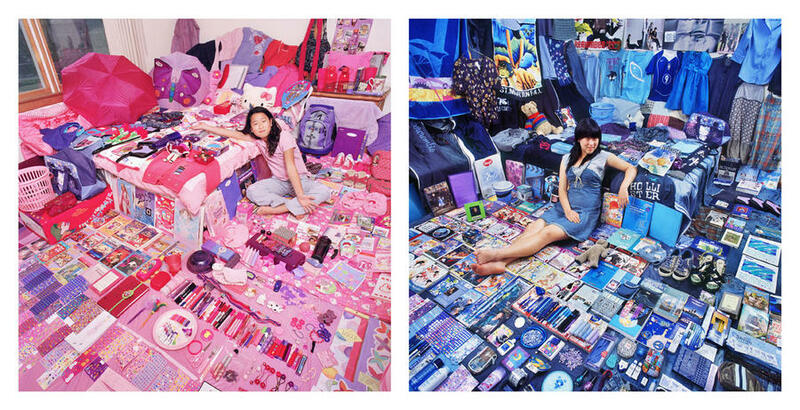 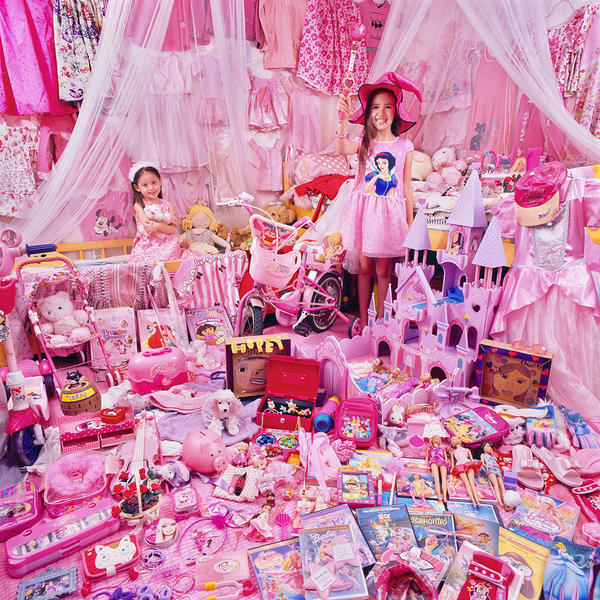 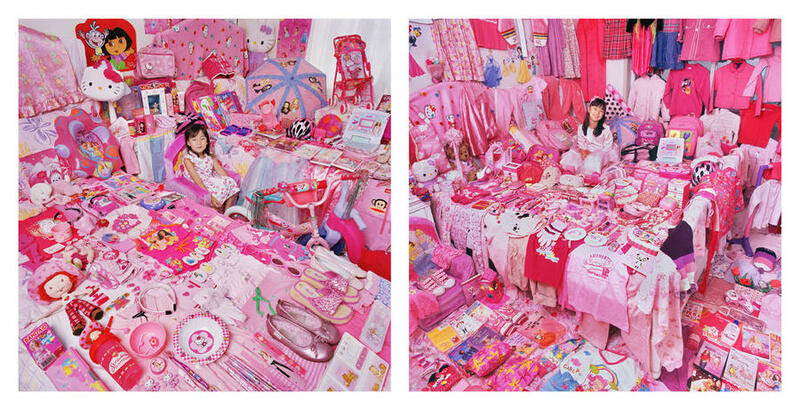 To make The Pink and Blue Project, I visited children’s rooms, where I displayed their possessions in an effort to show the viewer the extent to which children and their parents, knowingly or unknowing, are influenced by advertising and popular culture. 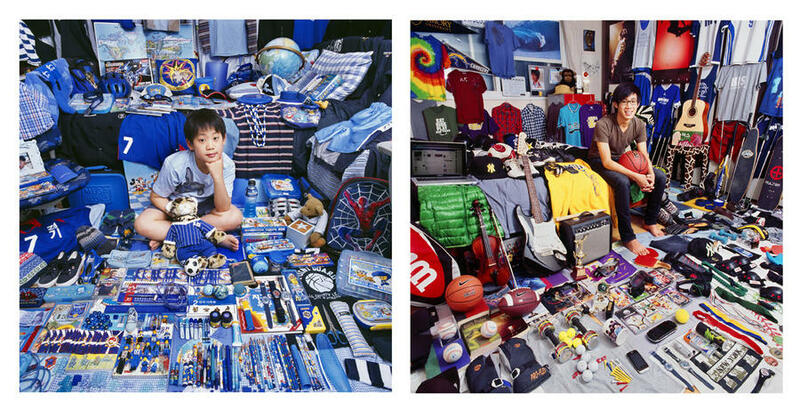 I use a 6x6 format Hasselblad camera to make the objects seem more crowded and spectacular. 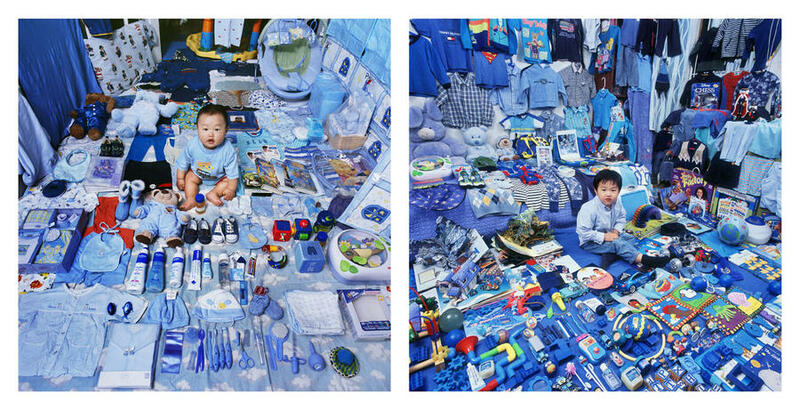 To achieve a hyper-realistic painterly quality, I use the f-22. 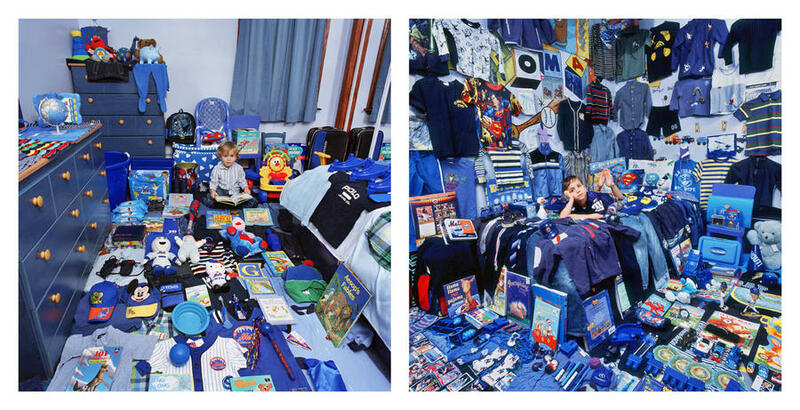 Diffused lighting is used in order to flash all the articles in a small room evenly. 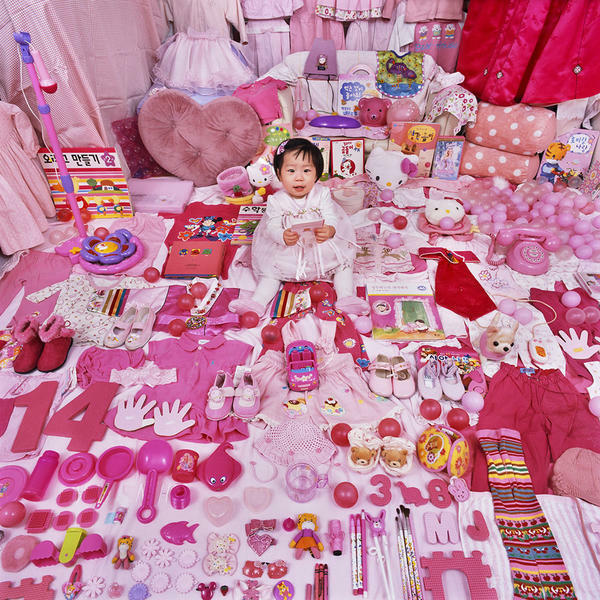 Born in Seoul in 1969, she majored in painting at Seoul National University, photography design at hongik University and studied at the School of Visual Arts in 2006. 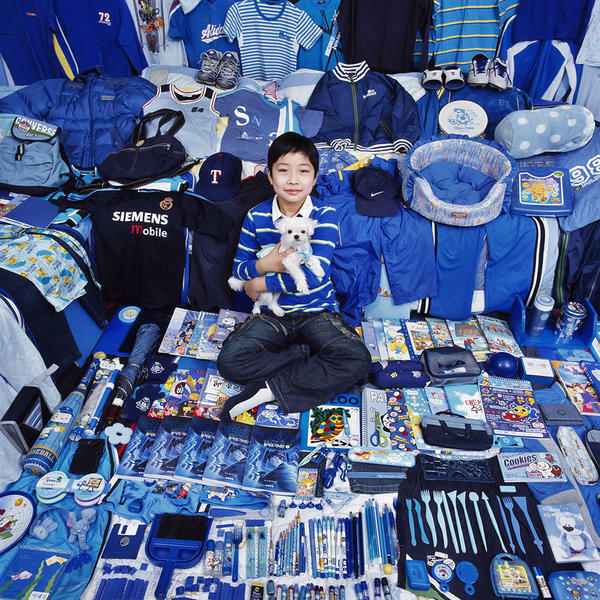 Yoon’s works not only have been illuminated by numerous group exhibitions at Museums in Europe, USA, and Asia and high-profile solo exhibitions of The Pink & Blue Project showed at Gallery Inn, Seoul, South Korean, Jenkins Johnson Gallery in New York, San Francisco and La Caja Blanca Gallery in Spain, but also collected by enterprises and both prominent museums both in Korea and overseas.